By the gushing of myrrh from your tomb O Father. 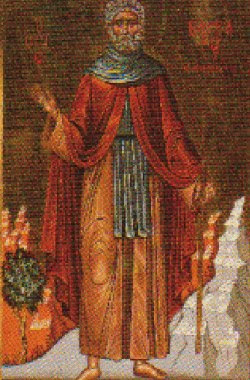 Saint Barbaros lived during the reign of Emperor Michael the Stammerer (820-829). A former robber from Arabia, he ventured with his band of pirates to Acarnania in Greece and for a long time he committed robberies, extortions and murders. The Acarnanians revolted against these pirates and killed them all, except Barbaros who escaped. But the Lord, Who does not desire the death of a sinner, turned him to repentance. Once, when Barbaros was sitting in a cave and gazing upon his stolen possessions, the grace of God touched his heart. He thought about the inevitability of death and pondered over the multitude of his wicked deeds. He was distressed in his heart and he decided to make a beginning of repentance, saying, "The Lord did not despise the prayer of the robber hanging beside Him. May He spare me through His ineffable mercy." 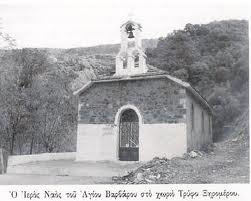 Barbaros left all his treasures behind in the cave and he went to the nearest church, which was dedicated to Saint George the Great Martyr in Nisa. During the Divine Liturgy, Barbaros saw angels serving with the priest named John Nikopolitou. Afterwards he asked the priest where were the men he was serving with, to which the priest replied that God had granted him a rare vision of the holy angels serving at the Divine Liturgy. Barbaros did not conceal his wicked deeds from the priest, and he asked to be accepted for repentance and catechism. The priest gave him a place in his own home, and Barbaros followed him, going about on his hands and knees like a four-legged animal, since he considered himself unworthy to be called a man. In the household of the priest he lived with the cattle, eating with the animals and considering himself more wicked than any creature. Indeed, to recall his sins, he decided to remain for the rest of his life, tied at the neck, waist and legs with three chains just as he tied to his victims when he was a robber. The three chains were in honor of the Holy Trinity. Having received absolution from his sins from the priest, Barbaros went into the woods of Tryfo in Xiromero of the municipality of Aetolia-Acarnania and lived there for twelve years (or eighteen years depending on sources), naked and without clothing, suffering from the cold and heat. His body became dirty and blackened all over. Finally, Barbaros received a sign from on high that his sins were forgiven, and that he would die a martyr's death. Once, merchants came to the place where Barbaros labored. In the deep grass before them they saw something moving. Thinking that this was an animal, they shot several arrows from their bows. Coming closer, they were terrified to see that they had mortally wounded a man. Barbaros begged them not to grieve. He told them about himself and he asked that they relate what had happened to the priest at whose house he had once lived. After this, Saint Barbaros yielded up his spirit to God. The priest, who had accepted the repentance of the former robber, found his body shining with a heavenly light. The priest buried the body of Saintt Barbaros at the place where he was killed on June 23. Afterwards, a curative myrrh began to issue forth from the grave of the Saint, which healed various maladies. At his burial a woman blind for seven years was healed. From then on many miracles are recorded. Nearby the grave is a spring from which many faithful apply to various wounds for healing. Patriarch Kallistos of Constantinople in 1355 and Joseph Bryennios in 1400 tell us that Bulgarians were baptized in this spring. 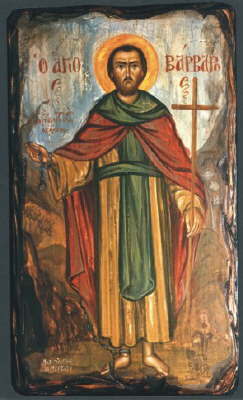 Constantine Akropolites says his daughter was healed of leprosy by Saint Barbaros. In 1571 a Venetian soldier named Sklavounos, who took part in the Battle of Lepanto, became sick and was near death. He had a dream of Saint Barbaros who told him to visit his grave in order to be healed. When he arrived at the grave of the Saint he venerated his holy relics and immediately began to recover. Wanting to honor the Saint in his homeland, he decided to bring the relics of the Saint to Venice. 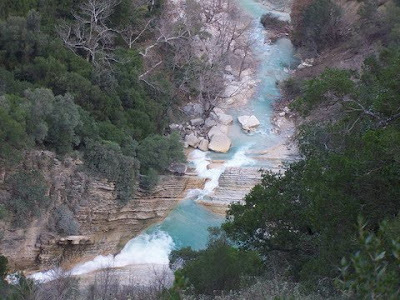 On his way, he decided to stop his ship in Kerkyra in the village of Potamos. Here the relics of the Saint cured a paralytic child of the Souvlaki family. Sklavounos allowed many of the sick in this place to come venerate the Saint, and many were healed. 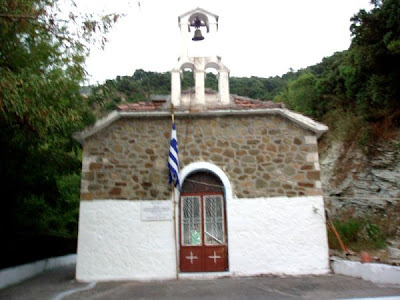 To honor Saint Barbaros, the locals renamed the church of their village from Life-Giving Spring to Saint Barbaros in honor of this event, and celebrate annually the healing of the paralyzed boy on May 15th. He is also celebrated on June 23 in Kerkyra as Saint Barbaros the Pentapoliti. The Cave of the Saint can still be seen in Tryfo of Aetolia-Acarnania near his church. Sources say the relics of the Saint are in a small Italian village known as Villa Barbaro. The chains of the Saint were lost when the Ottomans invaded Xiromero.